One day, according to ancient Greek legend, a poor peasant called Gordius arrived with his wife in a public square of Phrygia in an ox cart. As chance would have it, so the legend continues, an oracle had previously informed the populace that their future king would come into town riding in a wagon. Seeing Gordius, therefore, the people made him king. In gratitude, Gordius dedicated his ox cart to Zeus, tying it up with a highly intricate knot - - the Gordian knot. Another oracle -- or maybe the same one, the legend is not specific, but oracles are plentiful in Greek mythology -- foretold that the person who untied the knot would rule all of Asia. The problem of untying the Gordian knot resisted all attempted solutions until the year 333 B.C., when Alexander the Great -- not known for his lack of ambition when it came to ruling Asia -- cut through it with a sword. "Cheat!" you might cry. And although you might have been unwise to have pointed it out in Alexander's presence, his method did seem to go against the spirit of the problem. Surely, the challenge was to solve the puzzle solely by manipulating the knot, not by cutting it. But wait a minute. Alexander was no dummy. As a former student of Aristotle, he would have been no stranger to logical puzzles. After all, the ancient Greek problem of squaring the circle is easy to solve if you do not restrict yourself to the stipulated tools of ruler and compass. Today we know that the circle-squaring problem as posed by the Greeks is indeed unsolvable. Using ruler and compass you cannot construct a square with the same area as a given circle. Perhaps Alexander was able to see that the Gordian knot could not be untied simply by manipulating the rope. If so, then the knot surely could not have had any free ends. The two ends of the rope must have been spliced together. This, of course, would have made it a knot in the technical sense of modern mathematicians. Now, when modern topologists study knots, they assume the knots are constructed out of perfectly flexible, perfectly stretchable, infinitely thin string. Under those assumptions, if the Gordian knot were really an unkotted loop, then it would have been possible to untie it, i.e., to manipulate it so it was in the form of a simple loop that does not cross itself. Thus, the only thing that could make it absolutely necessary to resort to a sword to untie it would be that the physical thickness of the actual rope prevented the necessary manipulations being carried out. In principle, this could have been done. The rope could have been thoroughly wetted prior to tying, then dried rapidly in the sun after tying to make it shrink. This is the explanation proposed recently by physicist Piotr Pieranski of the Poznan University of Technology in Poland and the biologist Andrzej Stasiak of the University of Lausanne in Switzerland. Physicists are interested in knots because the latest theories of matter postulate that everything is made up of tightly coiled (and maybe knotted) loops of space-time, and biologists are interested in knots because the long, string-like molecules of DNA coil themselves up tightly to fit inside the cell. Pieranski and Stasiak have been studying knots that can be constructed from real, physical material, that has, in particular, a fixed diameter. This restriction makes the subject very different from the knot theory traditionally studied by mathematicians. 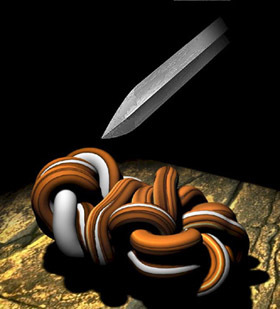 Pieranski has developed a computer program, called SONO (Shrink-On-No-Overlaps) to simulate the manipulation of such knots. To construct Pieranski's knot, you fold a circular loop of rope and tie two multiple overhand knots in it. You then pass the end loops over the entangled domains. Then you shrink the rope until it is tight. With this structure, there is not enough rope to allow the manipulations necessary to unravel it. Further details about Pieranski's Gordian Knot construction will be given in the paper Gordian Unknots, by Pieranski, Stasiak, and Sylwester Przybyl, currently in preparation.